Heat the oven to Gas 4/180C. Grease the dish or tin. In a saucepan cook the spinach with 2 tablesp. water. Press on a sieve to remove all the water. Chop the spring onions, crumble the cheese, crush the garlic and mix with the drained spinach, the eggs, lemon juice and herbs. Add a little salt and pepper. Melt the butter and stir in the oil. Unwrap the pastry, carefully peel off 5 sheets to line the base and sides of the dish, brushing each one with butter and allowing them to fold over the outside of the dish. 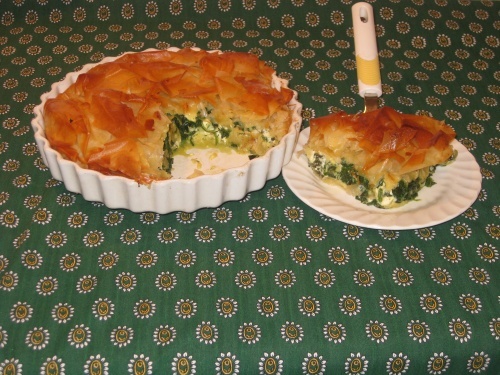 Fill with the spinach mixture and fold back over the tops of the filo pastry. Cover with crumpled remaining sheets of filo brushed with butter. Place the dish on a baking tray and bake for approx. 40 minutes until golden brown. If it is becoming too brown cover with a piece of foil.